It often happens that college students are assigned with a lot of assignments to do during vacations. This creates so much stress among students and because of that they rarely get time to enjoy as much as they want. And that’s why at that critical time, they visit assignment help websites and ask for assistance. Another reason why they do so is that the quality of the content in assignments degrades due to lack of focus during the festive seasons. And, as they have to do a plethora of task, they compromise with the quality which ultimately results in low grades. If you too are a sufferer of such situations, then there is no need to do such silly things. Ask us to do your assignment and celebrate this Christmas by being stress free from the academic load. What Are the Benefits of Availing Our Assignment Help Service? We give separate time and special attention to each assignment. We follow the guidelines very carefully. We never fail to provide them plagiarism-free paper. References are rightly mentioned by us. We make use of bullets points to make the content attractive and readable. Discount Up-To 50%. Is Anything Better Than This? Let us guess; no, nothing can be better than getting your work done at half the price. Over the years, Instant Assignment Help Australia is providing outstanding assignment help service to students. 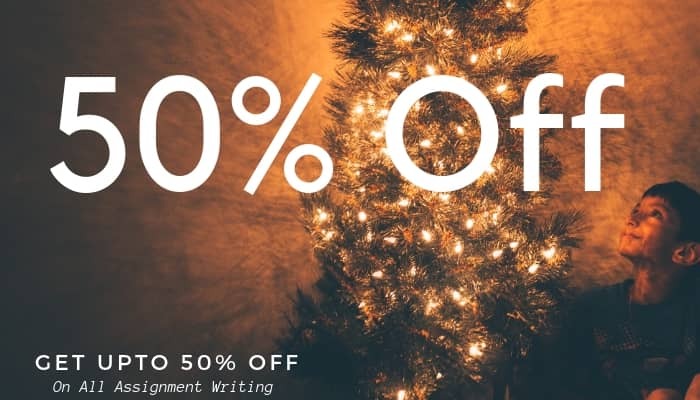 This Christmas, you can get such writing assistance, and that too at 50% off. This will help in easing down the academic burden of students without affecting their pocket. So, if you are loaded with too many academic tasks, then get the advantage of this amazing offer as soon as possible. Not everyone is lucky enough to avail the the above mentioned discount as only 100 lucky customers will get benefited. But, you don’t have to worry about that as we are offering flat 30% discount to our every customer, i.e., 5% more than the regular days. This offer is only valid till 24th midnight. So, what are you waiting for? Hurry up, contact and place all your writing orders with us to enjoy this auspicious festival with your loved ones. We will never let you down. This Christmas, we are not going to leave anything to make it special for you. And, we know that the only way to do is by offering more and more discounts. So, download our mobile app and get an additional discount of 5%. Isn’t it exciting? Did you ever thought that just by installing an app you will get such an amazing offer? Let us guess, you would have never thought of that. Well, Instant Assignment Help Australia has made this possible for you. Being a student, you shouldn’t miss out this great opportunity. Christmas 2018 is approaching day by day. So, make your plans, pack your bags, and go on a trip with your closed ones to make this occasion more special and a memorable one. If any academic tasks are acting as a hurdle in your way of fun, then don’t worry anymore. Place you order with us at the earliest and avail the suitable discounts.